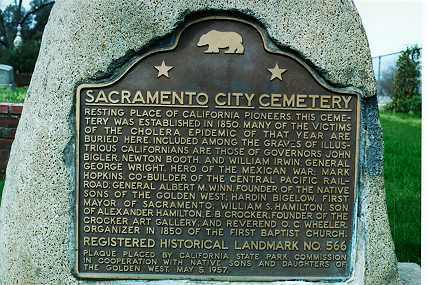 Resting place of California pioneers. 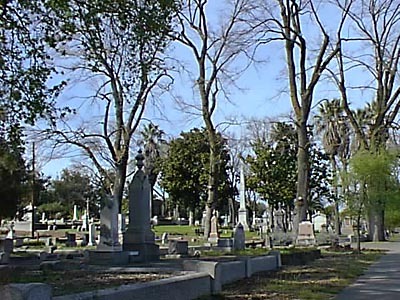 This cemetery was established in 1850. Many of the victims of the cholera epidemic of that year are buried here. Included among the graves of illustrious Californians are those of Governors John Bigler, Newton Booth, and William Irwin, General George Wright, hero of the Mexican War, Mark Hopkins, co-builder of the Central Pacific Railroad, General Albert M. Winn, founder of the Native Sons of the Golden West, Hardin Bigelow, first mayor of Sacramento, William S. Hamilton, son of Alexander Hamilton, E.B. Crocker, founder of the Crocker Art Gallery, and Reverend O.C. Wheeler, organizer in 1850 of the First Baptist Church. 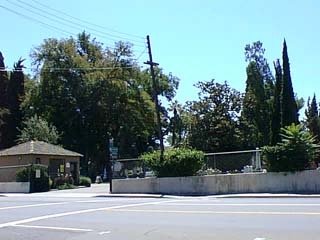 SW corner of Broadway and 10th Sts, Sacramento.